Mick Mulvaney was appointed by President Trump as acting head of the Consumer Financial Protection Bureau. As a congressman, Mulvaney sponsored legislation that would have abolished the agency. Mick Mulvaney was appointed by President Trump as acting head of the Consumer Financial Protection Bureau. As a congressman, Mulvaney sponsored legislation to abolish the agency. An epic throw-down happened Thursday on Capitol Hill over the role of the federal government. The topic: the Consumer Financial Protection Bureau, the agency created in the wake of the 2007-08 financial crisis. On one side was the Trump administration's acting director, Mick Mulvaney, who believes the bureau's powers are excessive and unchecked. On the other was Sen. Elizabeth Warren, D-Mass., who led the creation of the bureau to protect consumers from abuses by everything from big banks to student loan providers to fly-by-night loan sharks. Mulvaney, Trump's appointee, calls the bureau Warren's "baby." But Democrats say that over the past five months, he has done a terrible job of taking care of it. Back when he was a Republican congressman, Mulvaney sponsored legislation that would have abolished the bureau and called it a "sick, sad" joke. In Thursday's hearing of the Senate banking committee, Warren faced off with Mulvaney. "I want to take a look at what would have happened if you had gotten your wish and the CFPB had been abolished," she said. Since its creation, the bureau has returned a total of $12 billion to consumers by clawing back money from companies that cheated them. The people who benefited, Warren says, included seniors, students and active-duty military. "Here's what you don't get, Mr. Mulvaney. This isn't about me. This is about about active-duty military. It's about first responders and students and seniors and families ... and millions of other people who need someone on their side when consumers get cheated," Warren said. She added: "You are hurting real people to score cheap political points." Thursday's hearing was part of Mulvaney's mandated semiannual report to Congress on the activities of the CFPB. It was his second of back-to-back sessions. Maloney: "So let me ask you how many enforcement actions has the bureau initiated since you took over?" Mulvaney: "We have initiated none since I've been there." Mulvaney said he is bringing a less aggressive approach. His vision for the CFPB is one that is run with more humility and prudence. Maloney asked him, "Does your new approach involve bringing any actual enforcement actions?" Mulvaney countered that there were 100 active investigations and 25 ongoing lawsuits, though he acknowledged that the suits were initiated under the previous Obama-era director. Mulvaney insisted that he is enforcing the law. About the bureau itself, he said: "I have not burnt the place down." But Mulvaney said repeatedly that he thinks the bureau is far too independent and powerful. Congress doesn't control its spending — it gets its money from the Federal Reserve. As Mulvaney told Republican Sen. Richard Shelby of Alabama: "I could walk down to the Federal Reserve on Oct. 1st this year, Senator. If I ask for it — and I don't have to tell you what I'm going to do with it." To which, Shelby said: "Basically we've had no oversight of this agency." "I have to come here twice a year and that's about it," Mulvaney responded. He is asking lawmakers to put the bureau's budget under the control of Congress, place the director under the authority of the president and require that lawmakers vote to pass any new rules the bureau creates. Democrats and consumer advocates say that would put the consumer watchdog agency on a very short leash. In the wake of the financial crisis, Warren and others designed the bureau to be a strong, independent agency to protect consumers. It is funded by the Federal Reserve instead of by Congress, a move designed to shield it from political influence. But many Republicans argue the bureau's power is unchecked. "So powerful is the CFPB director that he alone has been granted the unprecedented power to declare any mortgage credit card or bank account unfair or abusive at which point Americans can't have them," said House committee Chairman Jeb Hensarling, R-Texas. Under Mulvaney's watch, the CFPB has dropped an investigation into a payday lender and announced that it will reconsider a rule to put stricter limits on companies that make high-interest, short-term loans. Consumer groups point to campaign contributions Mulvaney received from payday lenders when he was in Congress and say he is doing the industry's bidding. Mulvaney has said the campaign contributions do not constitute a conflict of interest. Next a major Washington face-off. At issue - a financial watchdog agency. On one side, Democratic Senator Elizabeth Warren of Massachusetts - she helped create the Consumer Financial Protection Bureau in the wake of the financial crisis - on the other, the Trump administration's interim director of the bureau. He wants to rein in its power. NPR's Chris Arnold reports. CHRIS ARNOLD, BYLINE: Putting Mick Mulvaney in charge of the Consumer Financial Protection Bureau - for Democrats, that's like Voldemort running Hogwarts. As a Republican congressman, Mulvaney sponsored legislation to abolish the bureau. He's called it a sad, sick joke. And now that he's running it, his critics say he's sitting on his hands and taking no actions to protect consumers. ELIZABETH WARREN: OK, so I want to take a look at what would have happened if you had gotten your wish and the CFPB had been abolished. ARNOLD: At a Senate hearing today, Democrat Elizabeth Warren fixed her piercing stare on Mulvaney. Since its creation, the bureau has returned about $12 billion to consumers by clawing back money from companies that cheated them. And Warren listed examples, including a company that she says was scamming 9/11 first responders out of money for their medical problems. WARREN: Mr. Mulvaney, if the CFPB had been abolished like you wanted, Top Notch funding might still be out there stealing from 9/11 first responders, right? WARREN: Or some other agency might magically have intervened when they didn't. ARNOLD: That's the Federal Trade Commission. And right there is the issue. 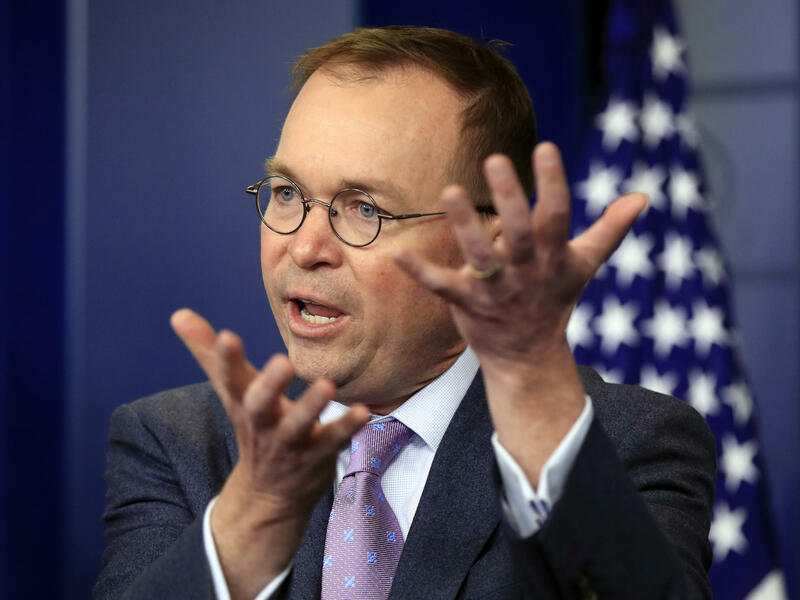 Mulvaney and other Republicans argue that there are existing regulators who already could do much of what the Consumer Protection Bureau was created to do. Warren and other Democrats say, but they didn't. And that's why millions of people lost their homes or jobs in the financial crisis, and why Congress created the bureau. Mulvaney told lawmakers this week that he is enforcing the law and not dismantling the agency. MULVANEY: I have not burnt the place down despite what you may have heard about what I was going to do when I've gotten there. I think that we have 10 fewer people working there now than the day I took over. MULVANEY: We have initiated none since I've been there. ARNOLD: For Mulvaney, some of his problems with the bureau appear to revolve around Elizabeth Warren herself. Yesterday in the House he said he didn't want the bureau to be, quote, "Elizabeth Warren's baby," and he wanted to make it a more accountable agency. Today Warren responded. She said Mulvaney appears to take joy in doing things with the bureau that would make her upset. WARREN: But here's what you don't get, Mr. Mulvaney. This isn't about me. This is about active duty military. It's about first responders and students and seniors and families and millions of other people who need someone on their side when consumers get cheated. You are hurting real people to score cheap political points. ARNOLD: Mulvaney didn't get a chance to respond to that. But he did say repeatedly that he thinks the bureau is far too independent and powerful. Congress doesn't control its spending. It gets its money from the Fed Reserve, as Mulvaney told Republican Senator Richard Shelby. MULVANEY: I can walk down to the Federal Reserve on October 1 this year, Senator, and they will give me $700 million if I ask for it. And I don't have to tell you what I'm going to do with it. RICHARD SHELBY: Basically, you suggest we've had no oversight of this agency, have we? MULVANEY: I have to come here twice a year, and that's about it. ARNOLD: Mulvaney asked lawmakers to put the watchdog bureau on a much tighter leash, for one thing requiring that Congress vote to approve any major new rules that the bureau makes and to control its budget. Some fellow Republicans expressed support, but lobbyists say such legislation would be unlikely to get past the Senate. Chris Arnold, NPR News.